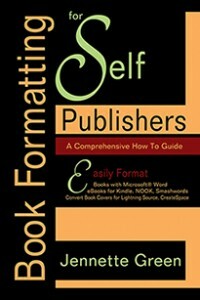 Book Formatting Commands for Microsoft Word 2011 for Mac can be found by clicking on this link. Lightning Source is now requiring small publishing companies to sign up with IngramSpark. In this program, instead of allowing publishers to set a discount of 20% to retailers, IngramSpark will only allow publishers to set a 40% or 55% discount. This means less money in your pocket, as a small publisher. Apparently, IngramSpark also requires publishers to sign exclusive ebook agreements, as well. Does this mean you can’t upload your ebooks directly to KDP, etc.? For more on this subject, visit the POD Publishers Yahoo Group (need to be a member first) and read this message. For more (older) updates regarding Lightning Source, please scroll down the page. Smashwords now supports Epub uploads via Smashwords Direct. Amazon recommends that covers be 2500 px tall (on the longest side), but only 1000 px is required. Barnes & Noble is now recommending that covers be between 1200 px and 2000 px in height. A tip to the wise: The maximum number of characters allowed in the LSI book description section is 4,000 characters. 08/12/12 Lightning Source has now changed the look of their cover templates. See this article for instructions on how to place guides and your cover on the new cover templates. 08/12/12 If you’re still working iwth LSI’s old cover template, visit this page to learn how to place guides and your cover on the old cover template.